Hosted by Professor Richard Toye, Centre academics are developing a series of podcasts on controversies in global and imperial history, which are available to listen to for free on this page. More to come soon, so keep checking back. With this first installment, Centre Director Andrew Thompson discusses the longstanding debates surrounding the work of Jack Gallagher and Ronald Robinson. In their path-breaking 1953 Economic History Review article, ‘The Imperialism of Free Trade’, Gallagher and Robinson suggested that the so-called ‘New Imperialism’ of the late nineteenth century was not new at all. They argued instead that imperial historians had previously missed Britain’s informal imperial expansion following its adoption of free trade policies c. 1850. 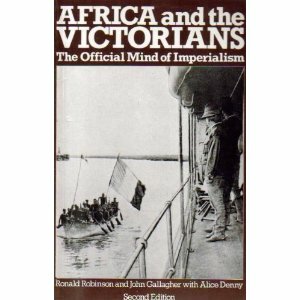 The authors expanded further upon their informal imperial findings with Africa and the Victorians: The Official Mind of Imperialism (1961). Professor Richard Toye and Centre Director Andrew Thompson discuss Robinson and Gallagher’s article ‘The Imperialism of Free Trade’. Richard Toye and Andrew Thompson discuss the partition of Africa in the late nineteenth-century and the famous phrase “the official mind of British Imperialism”. Richard Toye and Andrew Thompson discuss Robinson and Gallagher’s contribution to the vocabulary with which we think about empire today. Edward Said (1935-2003) was one of the foremost intellectuals of the Twentieth Century. Heavily influenced by the French philosopher Michel Foucault, his work spanned the fields of literature, history, and post-colonial studies. He was a controversial figure, and none of his work is more debated than his landmark 1978 book Orientalism. Said recast this term so that it referred to the structures of knowledge – or rather discourse – through which Westerners constructed the image of the East. Europeans, he suggested had typically cast ‘the Orient’ as simultaneously fascinating and effete, mysterious and corrupt. This was not merely an historical observation: Said regarded Orientalist ways of thinking as a form of oppression. Professor Toye is joined by Dr Justin Jones to talk about Edward Said’s famous 1978 book Orientalism. Professor Toye and Dr Jones discuss Edward Said’s work in more detail, and also explore criticisms of his ideas. Dr Justin Jones talks to Professor Richard Toye about his book Shi’a Islam in Colonial India: Religion, Community and Sectarianism and the process of researching it. In 2004, Bernard Porter published The Absent-Minded Imperialists: Empire, Society and Culture in Britain. It immediately became a controversial work. Porter later reflected that the book ‘was mainly a response to certain scholars (and some others) who, I felt, had hitherto simplified and exaggerated the impact of ‘imperialism’ on Britain in the nineteenth and twentieth centuries, after years in which, except by empire specialists like myself, it had been rather ignored and underplayed. […] the main argument of the book was this: that the ordinary Briton’s relationship to the Empire in the nineteenth and early twentieth centuries was complex and ambivalent, less soaked in or affected by imperialism than these other scholars claimed – to the extent that many English people, at any rate, possibly even a majority, were almost entirely ignorant of it for most of the nineteenth century.’ Professor Richard Toye discusses its contentious thesis and legacy. Dr Justin Jones interviews Professor Richard Toye about Bernard Porter’s 2004 book, The Absent-Minded Imperialists. There was a time during Churchill’s Liberal phase when some people perceived him as a Little Englander and a Radical who posed a danger to the Empire. Yet there is another side that must be considered too. Churchill spent most of his career in the Tory party – his Liberal phase was an interlude, albeit a lengthy one. He was also the man who in 1942 famously declared: ‘I have not become the King’s First Minister in order to preside over the liquidation of the British Empire.’ His remark appears deeply Conservative and emblematic of the ‘diehard’ point of view. In contrast to his earlier reputation, he now made conscious efforts to project himself as an opponent of modern liberalizing trends, who would never cede an inch of imperial territory. As Professor Richard Toye shows in his book Churchill’s Empire (2010), and as discussed below, Churchill thus proves to be a difficult figure to pigeon-hole on the issue of empire, appearing at the beginning of his political career as a Radical critic of imperialism, but ending his career as a Conservative defender of the imperial status quo. Dr Justin Jones talks to Professor Richard Toye about his recent book, Churchill’s Empire: The World that Made Him and the World He Made. Within the field of imperial history, Adam Smith’s Wealth of Nations (1776) is commonly associated with the anti-imperial economic doctrine that arose in the mid nineteenth century alongside the rise of Free Trade England. This ideology drew inspiration from Smith’s condemnation of the British Empire for being unnecessarily mercantilistic, expensive, and atavistic. Smith’s critique of imperialism came to be known as “Cobdenism”, named after Victorian free trade apostle, Richard Cobden, the anti-imperial radical who led the overthrow of England’s protectionist Corn Laws in 1846. But, as Dr. Marc-William Palen explains, the longer imperial legacy of the Wealth of Nations is much more…complicated. Smith’s work was transformed into an amorphous text regarding the imperial question throughout the late nineteenth and early twentieth century. Adam Smith had left behind an ambiguous legacy on the subject of empire: a legacy that left long-term effects upon subsequent British imperial debates. Professor Richard Toye interviews Dr. Marc-William Palen about Adam Smith’s book The Wealth of Nations, published in 1776, and its long-term legacy within British imperial history. William Appleman Williams is considered the founder of the “strongly influential” Wisconsin School of U.S. foreign relations imperial history. Williams’s book The Tragedy of American Diplomacy, first published in 1959, was the first of many revisionist imperial histories of American foreign policy that appeared amid what would become the broader radical New Left movement. Beginning with Tragedy, Wisconsin-School-inspired revisionist histories suggest that, owing to the distinctive nature of American capitalism, imperial presidents embarked upon a bipartisan quest for foreign markets with broad business and agrarian support, culminating in the acquisition of both a formal and informal American empire. Williams termed it “Open Door imperialism,” an American manifestation of “the imperialism of free trade.” Dr. Palen discusses the sizeable historiographical influence of Tragedy, particularly how it and subsequent New Left imperial revisionist historians helped overturn longstanding conceptions of American imperial expansion. As a result, The Tragedy of American Diplomacy continues to retain a dominant position within the study of American imperial history and historiography. Professor Richard Toye interviews Dr. Marc-William Palen about William Appleman Williams’s Tragedy of American Diplomacy (1959) and its long-term influence within American imperial history. Professor Richard Toye interviews Professor Martin Thomas on Frantz Fanon’s seminal text on decolonization, The Wretched of the Earth (1961). Born in the French Caribbean colony of Martinique, Fanon spent significant periods of his life in France and, crucially, Algeria. There he became an active member of the Front de Libération Nationale that fought, with ultimate success, against French rule. His most famous work The Wretched of the Earth, published shortly before his death from leukaemia, is a classic of decolonization literature. Professor Martin Thomas’s book Violence and Colonial Order: Police, Workers and Protest in the European Colonial Empires, 1918-1940 is a pioneering, multi-empire account of the relationship between the politics of imperial repression and the economic structures of European colonies between the two World Wars. Ranging across colonial Africa, Southeast Asia and the Caribbean, Thomas explores the structure of local police forces, their involvement in colonial labour control and the containment of uprisings and dissent. This work sheds new light on broader trends in the direction and intent of colonial state repression. It shows that the management of colonial economies, particularly in crisis conditions, took precedence over individual imperial powers’ particular methods of rule in determining the forms and functions of colonial police actions. In this Talking Empire podcast, Professor Richard Toye interviews Professor Thomas about the issues raised by the book. In 1902, journalist John A. Hobson published Imperialism: A Study. The book was among the first to connect the rise of finance capital with the growth of imperial expansion after 1870. Hobson’s theory would fast number among the most influential critiques of imperialism. Although Hobson himself was not a Marxist (he was a classical liberal), his theory would play a key role in shaping subsequent Marxist theories of imperialism, most notably that of V. I. Lenin. In this Talking Empire podcast, Centre Director Richard Toye discusses Hobson’s Imperialism with Dr. Marc-William Palen. V. I. Lenin penned and published his influential pamphlet, Imperialism: The Highest Stage of Capitalism, in the midst of the First World War. Building upon Marxist contemporaries like Hilferding and Bukharin as well as non-Marxist theorists like J. A. Hobson, Lenin’s pamphlet would quickly come to embody the orthodox Marxist critique concerning the relationship between modern capitalism and imperialism. In this Talking Empire podcast, Dr Marc-William Palen discusses Lenin’sImperialism and its legacy with Professor Richard Toye. This is very interesting, You arre a very skilled blogger. Also, I’ve sharded your website in my social networks! Isn’t it John Gallagher, rather than Jack? Thank you, this is amazing. We are using it with out A level students. I’m a history student really interested in the History of Empire. This is a truly incredible resource, thanks a lot!